Already football pundits are wondering if any team will come close to beating the Alabama Crimson Tide. Each week it is not about whether the Tide will win their game it is all about by how points they will win. Odds makers continue to shuffle the futures board as team win and lose. 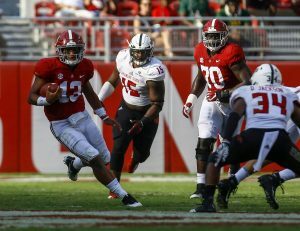 With an offense led by the tag team at quarterback of Tua Tagovailoa and Jalen Hurts added to a defense which to this point has allowed just 9.32 points per game, the championship in January has become the Tide’s to lose. As the week goes by and the wins accumulate for Alabama, the odds for the Tide will become less and less enticing to take. Alabama is currently +180 on several sportsbooks and those are likely the best odds bettors will see for Alabama going forward. Although not ranked No. 2 any longer in national polls, the Clemson Tigers continue to be a popular choice by odds makers to win the national title and hold the second best odds at +500 on the futures board. During Week 2, Clemson came very close to losing against Texas A&M, but a sign of an excellent team is winning when not playing well or pulling out a victory when the opposition played far better. That did not happen for the Wisconsin Badgers. The Badgers lost to the BYU Cougars last week and saw their odds to win the national title balloon from +1200 to +2800 knocking them out of the top 10 on the futures board. The Arizona State Sun Devils were given a big dose of reality after losing last week to the San Diego State Aztecs. Not only did the Sun Devils last just one week in the Top 25, but any conversation that may have arisen about a possible trip to the College Football Playoff was quickly squashed. Arizona State dropped back to +37500 from its best odds of +15000. Both Ohio State (+650) and Georgia (+750) are lurking with the third and fourth best odds respectively and if one or both reach the College Football Playoff could be competitive against the Crimson Tide. The Buckeyes balance of a potent offense with an excellent defense may be the combination needed to derail the Crimson Tide Train. Notre Dame at +1600 rounds out the five best odds to win the national title.